Chad Clinger | Galion Inquirer Graders’ lefty Austin Hathaway takes a healthy cut during GLSCL action on Friday night. Galion would drop the contest to the Grand Lake Mariners; 6-3. 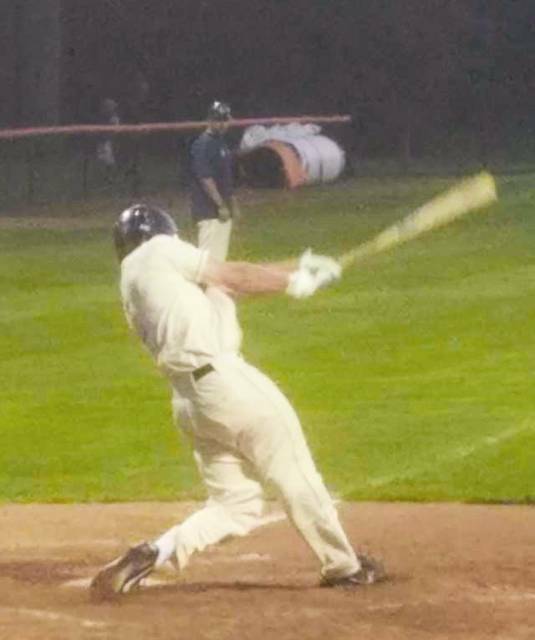 GALION — The Great Lakes Summer Collegiate League season is down to its final two games for the Galion Graders after hosting the Grand Lake Mariners at Heddleson Field in Heise Park on Friday night. Galion was unable to hold off a late-game rally by the visitors and dropped the contest to the Mariners; 6-3. Grand Lake moves to 23-16 and is still alive in post-season contention. With the defeat, the Graders dropped to 17-22 on the season. Grand Lake struck first with a run in the opening frame and would hold on to the slim 1-0 lead until the home-half of the second inning. Galion was able to put two runs on the board to take the 2-1 advantage, which they would hold on to until the top of the eighth. The Mariners would forge a rally, sparked by Graders’ errors and put up a five-spot to put the game at 6-2. Jake Hoover ripped a routine shot into right field to start the Galion portion of the eighth but was hustling from the moment that he left the batter’s box to stretch it into a double. Hoover would later score on a wild throw to third base to score Galion’s third and final run of the contest. Offensive production was lacking throughout the contest as Galion managed their three runs on the night on just four total hits. Grand Lake scored their six runs on nine hits while stranding six total runners on the base path. The Graders left seven men on base in the loss. Defensively, both teams committed three errors on the night but Galion’s turned out to be more costly, leading to many of the runs in the top of that eighth inning. Hoover led the way with a single and a double and the aforementioned run. Josh Kent and Joe Crank had the other two hits for the home team, both doubles. Crank drove in the two runs in the bottom of the second and Kent scored a run and stole a base to wrap the offense for the Graders. Dustin Baird got his first start of the season on Friday against the Mariners. Baird, primarily a middle-relief pitcher, went 7.1 innings, allowing seven hits and five runs (three earned) while walking three and striking out two. Clay Davies worked the remaining 1.2 innings, allowing just two hits, a run and striking out one batter. Baird took the loss on the night. Galion will host the Xenia Scouts of the Southern Division on Saturday night and then travel to Xenia’s home field on Sunday. The Scouts are currently 15-24 and will not be playing in the post-season either. As for the GLSCL playoff picture, here is what is set so far: The Lake Erie Monarchs have clinched the Northern Division; The Lima Locos have ran away with and clinched the Central Division; and the Richmond Jazz have won the Southern Division. All of those teams have secured a playoff spot, along with the Central Division runner-up, the Grand Lake Mariners. Only two spots remain and those spots are to be filled by the Northern and Southern Division runner-up. In the Northern Division, the St. Clair Green Giants currently (as of 07/29 at 9:15 am) hold a half-game lead over the Grand River Loggers. In the Southern, the Southern Ohio Copperheads hold a slim, half-game lead over the Cincinnati Steam. https://www.galioninquirer.com/wp-content/uploads/sites/38/2017/07/web1_Hath.jpgChad Clinger | Galion Inquirer Graders’ lefty Austin Hathaway takes a healthy cut during GLSCL action on Friday night. Galion would drop the contest to the Grand Lake Mariners; 6-3.